Lie flat on the floor and bend the legs from the knees so that your feet remain firmly on the floor. Now constricting your back and abdomen muscles gradually try to make your back fully touch the floor. Count 5 to 10 and then relax your body. 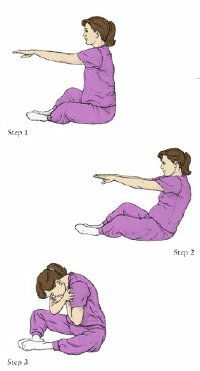 Now raising your head and shoulders a bit, constrict again your stomach muscles and try to touch your left toe with your right hand. Then reverse the exercise and try to touch your right toe with the left hand. Repeat it for about 5 to 10 times. Now sit on the floor with both the legs stretched and turn your feet from ankles as much upwards as possible. Repeat it for 8 to 10 times. Now rotate your feet in a circular motion. Do it for 8 to 10 times. This exercise reduces swelling on the feet and the cramps in the muscles.